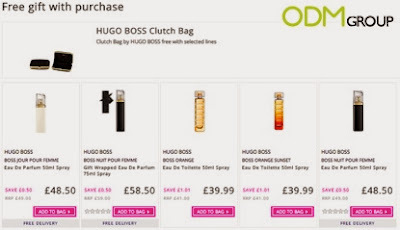 Get your hands on a free clutch bag when you purchase selected Hugo Boss fragrances from The Fragrance Shop. The clutch is made out of a black satin-like material that exudes luxury and class. This fantastic design makes it perfect for important black tie events or just a fun night out with your friends! This promotional product is absolutely stunning and you definitely do not want to miss out on this deal! Hugo Boss is a German luxury fashion and style house based in Germany. Over the years the fashion house has expanded to form the HUGO BOSS Group, which is one of the world market leaders in premiums and luxury items. Currently, Hugo Boss has a large company of brands under its name, from brands such as BOSS, BOSS Green, HUGO etc. Why offer a clutch bag as a gift with purchase? The clutch bag is a useful gift that your consumers can use of a regular basis, this will allow your company to take advantage of this and increase brand recall. When one constantly uses an item, it will cause the user to recall the brand every time it is being used. This will give you an edge over your competitors, as every time your customers think of your industry, the first brand that will come to mind is your company! It will definitely generate a massive amount of revenue for your company! In order to boost your company’s image, you can also consider making the clutch bag out of recyclable materials. This will help to improve your company’s corporate social responsibility.